Now that the rain and mud are gone, we’re out in the desert again. We hear an unusual sound — the beep-beep of a large vehicle backing up. Road equipment! Great! There’s a wash in the road that needs to be filled in and the washboard has become so bad that I’ve had to drive Darby Well Road at 10 mph. What a difference some sunshine makes in a day! The two remaining motor homes across the road leave this morning. Hmm . . . Do we want to move? The campsite we’re in is good. It’s handy, not too far from town, good cell signal, and somewhat secluded behind palo verde trees. The backyard view of Black Mountain is outstanding. We’ve camped here several days. A change would be fun. Yes, let’s move! Our new camp is higher. Now I can look over the desert for many miles. The cell signal is five bars, not easy to get in the Darby Well area. Tomorrow I’ll take more photos if it’s not raining again. Right after we move here, rain clouds come back making for dark photos. Here’s one anyway of our view looking to the west. I set up camp, including the important task of hanging the hummingbird feeder. I cook some chicken strips with fried potatoes and onions. Oh, it tastes so good. Ever so often I have to EAT HEARTY! I share some of the lean chicken with Bridget and Spike. We eat together happily, as if this is a celebration of our new camp home. The crew and I explore the front yard. Lots of saguaro, organ pipe, and interesting rock formations to photograph. I hear someone pull in. It’s a pick-up pulling a Casita! Spike and Bridget leave me and run down the lane to greet the couple walking up toward our campsite. It’s Glenda and Jeff, arriving from a stay at Fortuna Pond in Yuma and earlier from a Casita Rally at Dome Rock, Quartzsite. 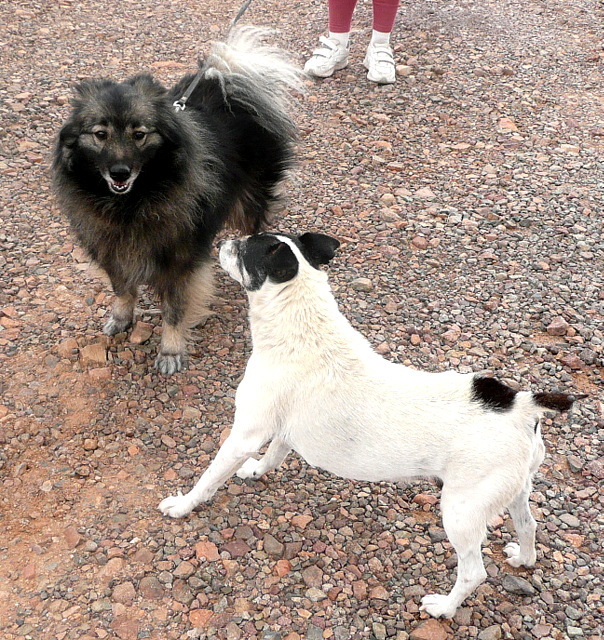 The crew makes the acquaintance of Kira, their fluffy keeshond. Spike is especially interested in this new pal. I recognize Glenda and Jeff right away from their blog, Casita Escapes, and also from seeing their photos on Travel with the Bayfield Bunch when they visited Al and Kelly recently. After chatting while standing in the lane between our campsites, we can smell rain in the air. Glenda and Jeff hurry to set up camp. As I type this, a light rain falls. I look online to check for the likelihood of an electrical storm. Everything looks fine. In fact, by the end of next week the temperature is expected to reach 80 degrees! P.S. Orders continue to come in through the Amazon links on this blog. I do appreciate you helping me make some extra cash. Plus it gives me the feeling that I’m gainfully employed while not doing a whole lot! This entry was posted in Simple living and tagged Ajo, casita, Darby Well, Fortuna Pond, keeshond, Quartzsite, rat terriers, RVing. Bookmark the permalink. 51 Responses to New campsite, new neighbors! Did you move to the great site where I parked? Hope so, it was the perfect site. You can be Queen of the Hill, that is how I felt up there. My ankle is feeling much better. Yes, that’s where we are! I’m Queen of the Hill and Queen of the Desert! I thought of you when I looked out over our “yard”. I’ll be careful on the loose rocks. Good to know your ankle is feeling better. I’ll be happy if my blog helps you find the right tow vehicle. BTW, the PTV gets 15 mpg on highway while towing. READERS: Can you give Dedra ideas on a fuel-efficient tow vehicle? I’m not a person who has ever towed. But with a small trailer like this, I think Sue has made the best possible choice. A chevy van is a great choice… storage… place to put solar… decent mileage. I would warn that the Ford E350 vans often have handling issues as do many of the older Dodges. Dedra – we tow our 2010 SD with an F150 and get 15 mpg (we do better out west for some reason). We have one of those fiberglass caps on the back of the truck and it’s pretty heavy, so I think without it we might do a little better. I may be overstepping with this question, but, will you be posting on your finance pages how much income you have received from amazon? If I ever get out there, I am planning on doing a blog also and am interested in alternative income resources. I think it’s important for single women (especially those of a “certain age”) to share their solo RV experiences so that others can take heart and know they can do it also. I know that your blog has given me more courage in knowing that I can fulfill that dream also. You’re not overstepping at all, Donna. I planned from the start to reveal how much income the Amazon links generate. There is a lag time between the placing of orders to money going to my bank. Although I see a daily report of earnings, I’m waiting for the first deposit from Amazon which should be at the end of March. At that time I’ll post the amount in a blog entry and it will also show up as income on the March financial page. The dollar amount will be most accurate that way, considering that sometimes people return items. Hey, those “small” purchases add up! The more purchases in a month, the higher my percentage of commission. Right now as I type this I’m at 7%… so thank you very much, John! Sue, that’s great! I just ordered the Az. and Utah maps that you recommended through your link and will continue to use the link for all our future purchases. So pleased to give back a bit of positive Karma in thanks for your most excellent blog. BTW, we did it!! We moved out of our house yesterday and are waiting for the rain to stop so I can install the solar system; then it’s off to find the sun! Hallelujah! You’re free! Now you can use your maps to dream up adventures. Good luck with the solar installation . . . Please say hello to Glenda & Jeff. 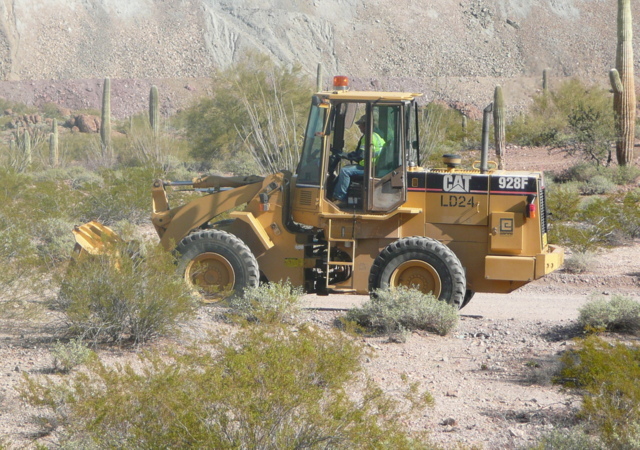 We loved our conversations with them at Quartzsite. Hope they enjoyed Fortuna Pond. I’ll do that, John, although I expect they will see your hello here. Jeff did some fishing at Fortuna. They said it was crowded there. . . with people, not necessarily with fish! Oh my what a small world! Tell Glenda and Jeff…Jules is wondering how the VCR is working out! I came across their blog like I did with yours….they were working as a camp host…somewhere..working in the kitchen and gift shop. Their VCR broke and they missed taping tv shows. We had a brand new one..that we dragged from California..wasn’t going to use it..so we sent it to them. Please tell the we said hello. At least the rain will make the dust settle. What was your description of the rain smell again? I’ll take snow instead of rain any day. I hate muddy dog paw prints on the kitchen floor. SaraAnn knows to sit and wait until her paws are rinsed off. 80 degrees? I am so jealous! Is Spike’s hair up? Trying to get Kira to play? I’ll tell Glenda and Jeff tomorrow to read your comment. It’s raining lightly now in the early evening. More muddy paws tomorrow and I cleaned the floor today! Oh well, it’s not like that’s a big job. I’m glad I don’t have carpet. Spike hops around with his hair on end whenever he meets another canine. He gets very excited. Bridget? She goes, “meh” and walks off. Spike looks like he just might get aggressive. Is it all show? Or does it depend on how the other dog reacts? Dogs are such funny creatures. Mugsy is a mix… she jumps up and down and acts like an idiot… they touch noses… then “meh” … I’m bored… let’s walk on. Hey John. You left Q too soon. It finally warmed up there before we left. Found Fortunately Pond without a problem. Beautiful but all sand based, no privacy & pretty noisy. I needed to see fresh water & big trees tho. Ajo is a unique place. It was hard to miss Sue on the hill & there’re great views everywhere. Yes, the VCR works perfectly & was so appreciated for recording evening TV while we worked in Branson last summer. Tkx again. There’re not many trees in the way out here so the sat TV dvr is back in svc . 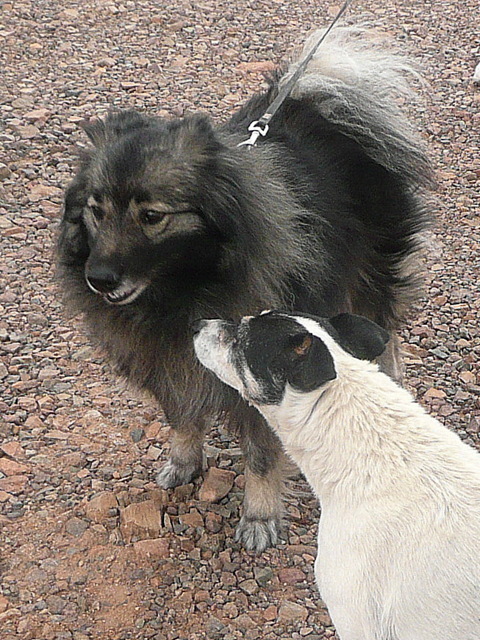 Kira was raised with cats & is confused, scared & gentle with small dogs. I was just looking at the shopping page & the Benchmark maps. I had to chuckle seeing the pic of Spike looking at the map, no doubt planning his next mis-adventure!! I don’t have a blog yet but I’m trying to learn about blogging, being an affiliate, etc. It all seems a little complex! If I click on a product on your shopping list, it sends me to Amazon & if I buy the item you earn a commission, right? What if I don’t buy that particular item but I buy something else – because I entered Amazon from your link, will you still earn money or is it only for the specific items you have listed on your shopping page? Also, do you get the pictures of the items directly from the Amazon page & post them on your site? Sorry for the long post & all the questions. I really appreciate you being willing to share your knowledge! I enjoy answering questions. I guess that’s why I was a teacher. It doesn’t matter what you buy. If you entered Amazon via one of my links, I get credit for your purchase of any of the gazillion products Amazon offers. According to Amazon terms of service, I’m allowed to use their “official” photo of a product in my blog. I simply copy the image and paste. I inquired whether it’s okay to use my own photos with my own models (the crew), too. To become an Amazon Affiliate you must have your blog or website up for at least six months. It must have original content, not just existing for the purpose of showing a bunch of Amazon ads. That’s great! I just assumed that you only received credit for the items that you listed on your shopping page. It’s good to know that you get credit for any Amazon purchases if we go through your links. Gave me a chuckle seeing the Keeshond dog…reminded me of one of the funnier episodes on All Creatures Great and Small!! Loved that video series!! Sounds like you are having an awful lot of fun!! You know, Elizabeth… I have what I think of as “happy attacks.” That’s when it suddenly hits me how wonderful my life is, and I’m filled with gratitude and happiness. I had an attack today. I never saw that video series. I read the book though. I think anyone who loves animals and finds British humor funny would love that video series!! Maybe you could borrow it from some library along the way? It is great to have “happy attacks” isn’t it?? We have gotten to skype with the older grandchildren several days this week. We realize it may not continue, at any point, but we are sure happy right now. We were studying a language together that hubby and I are learning and teaching them now. SO FUN!! I forgot to ask…………………..How is the lock on the BLT? I forgot all about it. It’s been working okay. I’m making sure it clicks before I attempt to lock with the key. I’ve shopped Amazon for years and continue to do so, but now always through your link. You give us all so much enjoyment with your blog. You are the eyes to places we all hope to visit one day, providing information all wanabee RVers soak up, and of course…the antics of Bridget and Spike, all fun to read. Shopping through your link and helping you earn a few bucks is definitely a pleasure to do for you. Hi, wiandflbev . . . If I haven’t said so yet, welcome to my blog. I’m happy to hear from you! I appreciate you shopping Amazon via my links as a way to say thank you. I’ll keep that in mind when blogging! Your purchase most certainly helps my cause . . . to live and travel in my trailer with my two best pals. Thank you for remembering my Amazon links. I know you will enjoy your Kindle Fire. Snow has melted off of the mountains already and here it is only 12:15 PM in Wikieup Arizona. The sun is shinning and I’m heading out into the deserted desert in search of Gold and other adventures. First day of Havalina hunting season so I better wear an orange colored hat so I won’t get shot at thinking I might be a pig…but heck I’ve been called worse. I wonder if javelina hunters use calls and, if so, what do they sound like? You’re more likely to be shot if you find gold, Joe. Good luck with your prospecting anyway. To answer your first question: When they call it sounds like this, ” Hey Jim is that you over there making all the racket”? The calls are usually in English too. Yep we all carry shootin irons down here just in case of Claim Jumpers and Wikieup AZ is the Rattlesnake capital of the world…sometimes they walk on two legs you know! Hello RV Sue and Crew, thank you for the good wishes in Al and Kelly’s shout box. I was very flattered with Al’s comparison! Love your blog! I’m very happy for you, Jeri, and had to let you know! I’m still enjoying your blog very much. Thanks – I know it takes a lot of time and effort. I bought an Amazon gift card through your link recently for a friend’s birthday present – I hope you get credit for gift cards. Just curious… are Rick and Lady still in the area? Hi, Kay! I saw your order . . . Thanks very much! Yes, Rick and Lady are here, further in. Dedra, My wife and I are Snowbirds and live in our 17′ Casita and pull it with a Toyota Tundra 4×4 Access Cab with a camper shell. The back is loaded with camping stuff. I get 14mpg but if you get the 2 wheel drive it would bump it up to 15 I betcha. If you camp a lot get a pick up truck with a camper shell that has WINDOORS. These are side windows that open up with two locking knobs. It is easy to get what you need out of the back this way instead of climbing over all your stuff to get something. If you are full timing you will appreciate the 4.7L V/8 Engine of the Tundra. If you only camp occasionally the Toyota Tacoma with the V/6 will work good…unless you plan to go over some steep mountains. If it is just you going camping I would go with the Tacoma, if more people I would want the Tundra. Vans are nice if you don’t go off road much. But I like to sit up high so you can look around and SEE traffic and conditions, so I vote for a truck. Don’t forget your deer whistles on the front bumper. Um, I have to say this… I sit way up high in the PTV! Oh yeah well if you take your pillow away you just have a purty bumper car with lots of room ha. Pffftt… I know perfect when I see it. Ha. Ha. 4.7 liter… double pffft. I wish I could get the last word but I’m gonna give up.